Or, get it for 36000 Kobo Super Points! This book incorporates the experience of numerous experts who explore contemporary opinion of how best to rationalise and optimise the interfaces at total hip replacement to provide the most favourable and durable results. The survival of a total hip replacement depends principally on the enduring integrity of the fixation interfaces and of the articular interface. The design of the stem and the material properties of cement largely determine the state of the component-cement inter­ face, while the bone-cement interface is significantly influenced by both mechanical and biological factors. The surface finish and shape of cementless implants are designed to preserve the integrity of biological fixation (osseo-integration) at the bone-component interface. Once again, both mechanical and biological factors have to be considered, while bioactive coatings accelerate bone ongrowth. Metal-on-polyethylene is the most widely used articular interface. However, it has been suggested that wear of polyethylene is one of the major factors contributing to failure of total hip replacements. The increasing prevalence of total hip replacement in younger patients has stimulated the investigation of alternative, more durable couples -including ceramic-polyethylene, ceramic-ceramic and metal-on-metal. Modularity provides greater intra-operative flexibility, but each new modular interface introduces new mechanisms of failure. These need to be anticipated and appropriate measures taken to avoid them. 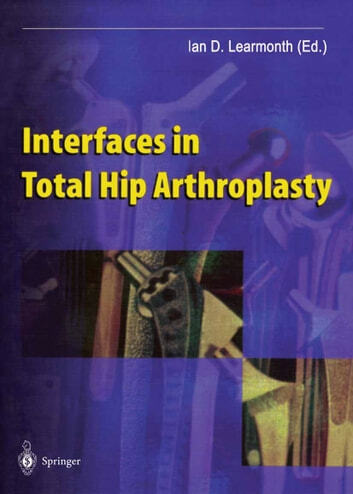 Hopefully this book will provide a better understanding of the factors that contribute to stable interfaces and long-term survival of total hip arthroplasty.